Prime Minister Victor Ponta led the first round of Romania’s presidential election yesterday (2 November), a step towards a victory that would consolidate his leftist Social Democrat party’s hold on power but which raised questions about judicial independence. Partial results showed Ponta, a former prosecutor and amateur rally driver who became the European Union’s youngest prime minister two years ago, ahead of his nearest challenger, an ethnic German mayor backed by two centre-right parties. The two will head to a run-off on 16 November. Ponta was ahead on 39.6% of the vote compared to 30.2% for Klaus Iohannis, who will try to rally the anti-Ponta vote around him in order to close the gap. The result was announced with 56% of polling stations counted, and broadly reflected exit polls released on Sunday evening. The turnout was 52.6%. Twelve other candidates participated to the election in what was seen as a “competition for the third place”. A Ponta presidency could bring more stability to the Black Sea country of 20 million, which endured a painful recession and spending cuts during the global slowdown and has made mixed progress in implementing reforms under an IMF-led aid deal. As prime minister, Ponta often feuded with his bitter rival, outgoing President Traian B?sescu, which stymied policymaking. “I feel extremely proud and I thank Romanians who trusted my project after 10 years of lying and division,” Ponta, 42, said in televised comments at his party headquarters late on Sunday, making a dig at B?sescu who served as president for a decade. Ponta’s attempt to have B?sescu impeached in a 2012 national referendum drew sharp EU criticism and hurt the leu currency. “Investors are very wary of Romanian politics causing selloffs in the currency,” said Demetrios Efstathiou, the head of CEEMEA Strategy, Global Markets, at Standard Bank Plc. 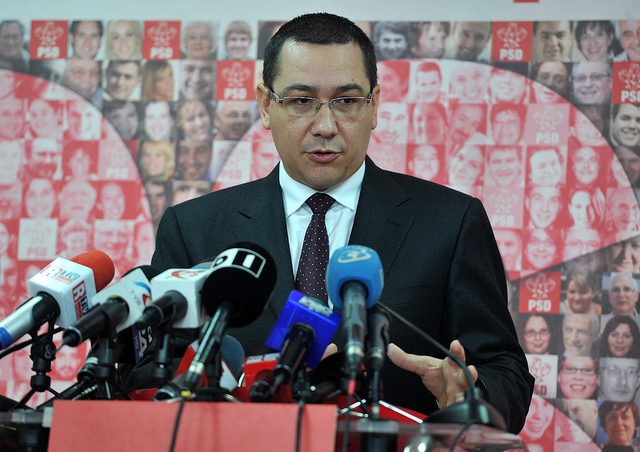 Ponta has consistently led opinion polls over Iohannis, who is credited with transforming the Transylvanian city of Sibiu. The Social Democrats, heirs to the Communists whose single-party rule was toppled in a 1989 revolution, have courted voters by increasing pensions and wages for state workers cut under Ponta’s predecessor. Ponta has pledged to hike pensions again next year, has cut value added tax on items such as bread and also reduced an employment tax. But his campaign was hit by setbacks as well. B?sescu accused Ponta of spying for the foreign intelligence service in the 1990s – a charge Ponta’s camp rejected as a political smear. Ponta’s father-in-law and other ruling party politicians were also hit by graft allegations in the last weeks of the campaign. Romania joined the EU in 2007 but remains its second poorest and also one of its most corrupt member states, driving millions abroad in search of better pay and living standards. It has struggled to absorb EU development funds needed, for example, to fix a shoddy road network. Tax evasion is rife and nearly half of all households lack an indoor bathroom. Many Romanians living abroad could not vote on Sunday, as polling stations ran out of ballots, sparking protests outside the foreign ministry in Bucharest. Many also complained of long queues as they waited to vote. Tempers flared at the Romanian embassy in Paris, which called in the French police for help, according to an election bureau spokesman. Ion ?iriac, a former French Open tennis doubles winner and one of Romania’s richest businessmen, said he flew to Romania to vote after long queues prevented him from voting in Paris. Without the check on power hitherto provided by B?sescu, Ponta’s rise has raised concerns that he might tighten political control over the judiciary and anti-corruption prosecutors. Ponta rebuffed EU criticism in 2012 that he did not appear to respect the rule of law and democratic institutions, denying allegations that he had put pressure on judges. In Romania, the president is not only a ceremonial figure – he also exerts influence on the executive by appointing the new prime minister, judges and prosecutors, and he can stall government policy proposals. It is unclear at this stage whom Ponta might choose to succeed him as prime minister if he wins the presidency. Ponta, and the new government he would help shape, might loosen fiscal policy and end the deal with the International Monetary Fund. The €4 billion agreement, which expires next year, has bolstered Romania’s credibility with investors and nudged successive governments to reform. “After the IMF agreement expires there will be two questions. Will it be further extended?” Greg Konieczny, the manager of Romanian investment fund Fondul Proprietatea, said in a recent interview. Thanks to Basescu’s lies and a full decade abusive regime, “Independence of Justice” and “Rule of Law” rhetoric. The imposed/imported political agenda from Merkel’s/Neocons selfish economic interests. Hopefully Romanians will CHANGE it.